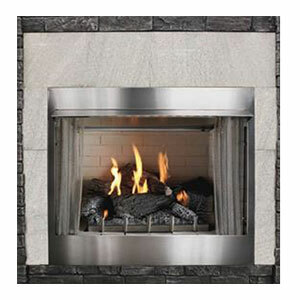 Empire Traditional Carol Rose Outdoor Premium Fireplace features an all-stainless exterior. Stainless steel is featured inside the fireplace. The standard refractory liner provides thermal mass to help minimize temperature fluctuations for your guests. The 36-inch fireplace is rated at 50,000 BTUs. Valve and controls are concealed beneath the fireplace floor adding to the seamless beauty of the outdoor fireplace. The ambiance of Empire's Traditional Carol Rose fireplace extends the season for the outdoor living space you worked so hard to create. You'll love spending time with family and friends surrounded by the warmth provided by the Traditional Carol Rose.